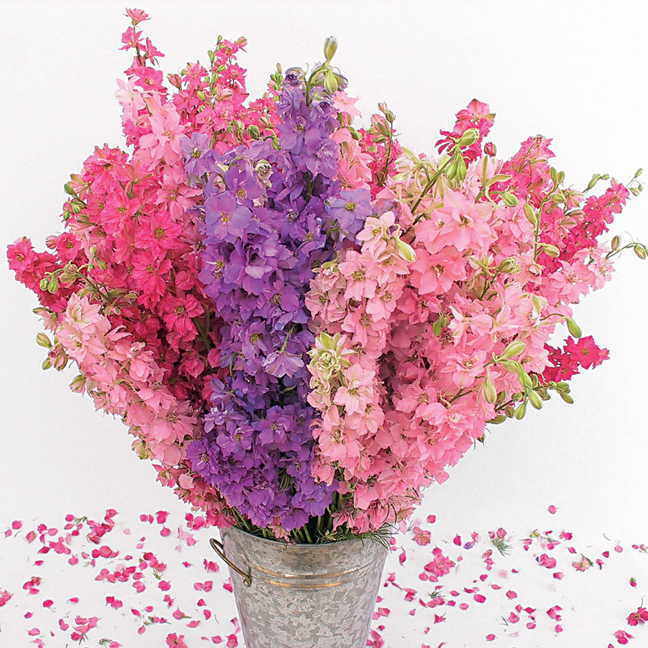 Even the fallen petals of this stunning Larkspur arrangement are gorgeous! One of the great joys of growing flowers is being able to cut a big bouquet for the house or arrange little nosegays for friends! Here are a few tips for making the most of your cut-flowers, so that you can enjoy these arrangements a little longer. Love Sunflowers in the vase? Be sure to choose pollen-free varieties to avoid clean-up! Who says flowers have to look like flowers? 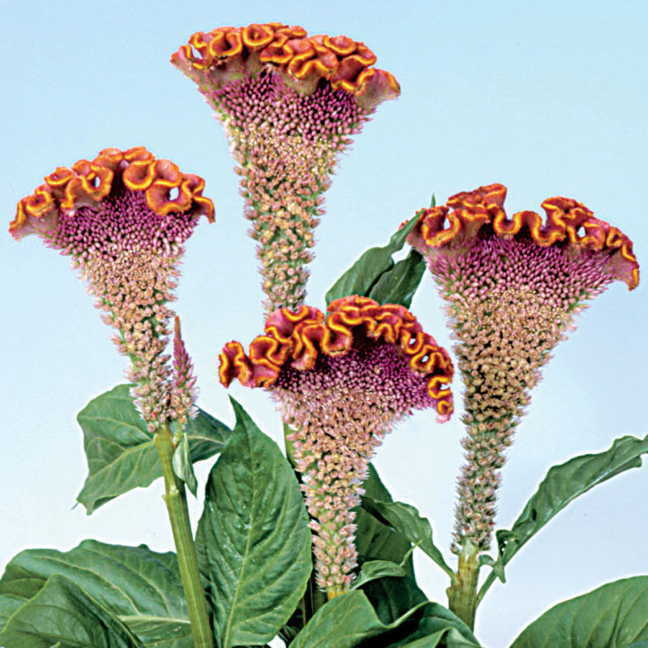 This cockscomb Celosia adds unique texture. Amaranthus and Florist’s Poppy are other nontraditional looks. 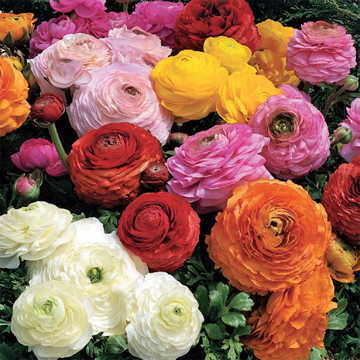 Place your freshly cut flowers in a bucket of cool water to soak for an hour or two before arranging your final product. Some people even take this bucket with them in the garden and plop the fresh-cut stems right into it. To help your bouquet last longer, a commercial floral preservative will help. 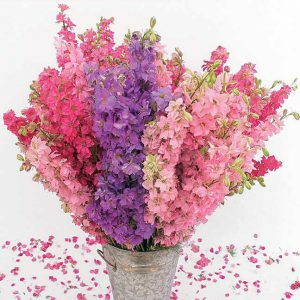 (Those little packets of freshener you get with store-bought bouquets are ideal.) This will feed your flowers, maintain a constant pH, and serve as an anti-microbial to prevent premature decay. 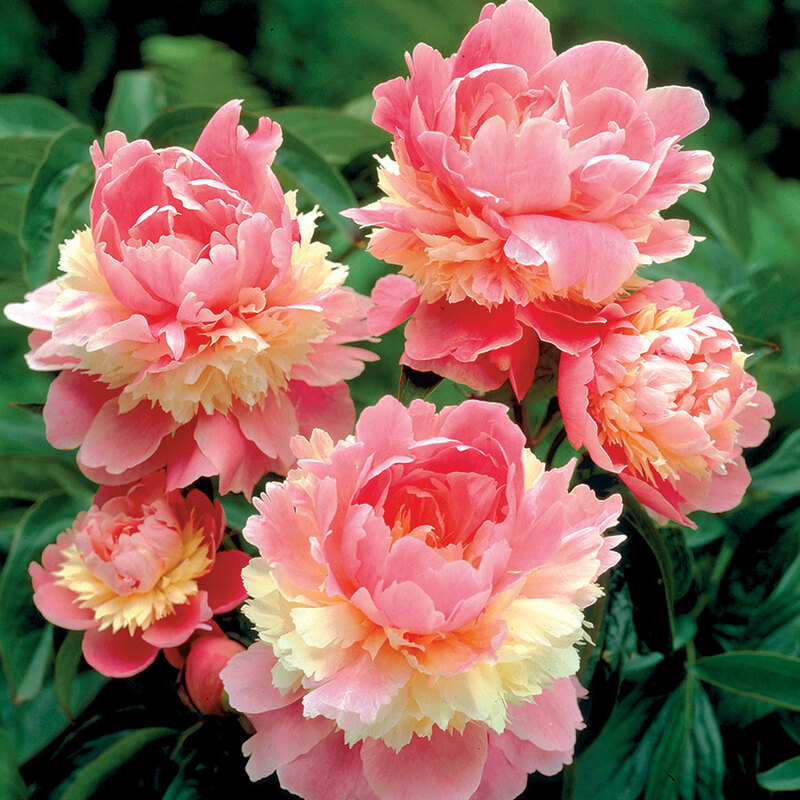 Rose may be the Queen of the Garden, but Peony is surely the Queen Mother! These beautiful blooms can last for several weeks after cutting. 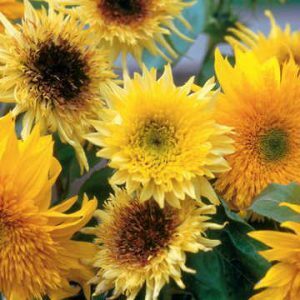 Once you have created your floral masterpiece, keep it out of drafty areas and direct sunlight to prevent the flowers from drying. Finally, you can just sit back and admire your new décor or enjoy your special moment. When the flowers pass, don’t throw the leftover water away! Pour it onto houseplants or outdoor plants for a nutritious boost. They will love it!